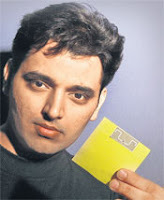 I got the above image of Pranav Mistry demonstrating sixth sense technology from here. Featured above is Pranav Mistry (please click here to get the source of above image) Ph D, born at Palanpur, India, and now with the famous MIT Media lab. ( This fantastic lab has always contributed hugely to inventing a better world!). Indians have an inbuilt cultural knack to relate abstract concepts to the real world. It perhaps stems from the fact that Indians grow up grappling with abstract subjects. For eg., transmigration of the soul, rebirth, karma, law of cause and effect, Bhakti Yoga (wherein the devotee concentrates his feelings of pure love towards an abstract subject like a God he has never perceived with his senses) ... these are some of the abstract subjects or issues that a person grows up with, in India. This innately makes an Indian relate abstractness with realism. May be this is why, Pranav Mistry has pioneered a new type of technology called sixth sense to the real world. Pranav's technology is all set to make seemingly impossible things possible! Imagine you get a Rx from a doctor, and the doctor (as is common) did not get much time to counsel you on the ailment and drugs prescribed. Now, don't get upset, Pranav's sixth sense tech will help you. Come out of the doctor's office, hold the Rx aloft. And gesture near the Rx say towards the first brand written on the Rx. The sixth sense gadget that you are wearing, will read your gesture and project useful information on to the Rx, so you can read it. So if a doctor has prescribed Aten 50 mg, the projected information (on to the Rx through light beams) would probably read as: Aten 50 mg helps lower raised blood pressure in patients suffering from hypertension (high blood pressure). Take Aten 50 mg, 15 minutes after breakfast with water. You may experience slight giddiness after the first dose. If the problem persists contact your doctor. Aten 50 mg protects your heart. Aten 50 mg improves quality of life and span of life. Log on to www.aten.com for further information! Sixth sense technology is the stuff of pure science fiction coming to reality!! Let us say, you are driving towards the airport to catch a flight (as with many pharma executives!). It is not uncommon in India to land up at the airport to find out that the flight has been delayed by say 2 hours. So you end up waiting at the airport nibbling at costly samosas. If you are enabled with sixth sense technology, well, you take out the ticket and hold it, and real-time information of the departure time and other details will be displayed (through projection of light beams) on the ticket or boarding pass. Kinda unbelievable, uncanny and mysterious!? Oh! Well!! I can understand, b'cos I too feel the same reading about this sixth sense stuff!! Today's mobile may morph in to a sixth sense device 2morro! The prototype of a sixth sense device is a pocket projector, mirror and camera. This stuff has some more hardware and a software that integrates the elements and runs it. For us pharma guys, it will probably remind us of an endoscope instantly! The basic philosophy behind the sixth sense stuff is merging the physical world with the digital. It is a bit like Indian philosophy, merging the supernatural world with the our material world. So how does this sixth sense gadget help? It is something like this: let us say a patient takes a prescription to a pharmacy. The pharmacist reads the Rx and dispenses the brand of, say, an electrolyte energy drink for faster recovery from the illness. The patient holds the pack, and gestures (rather moves his fingers taps at the panel containing the composition on the label). The sixth sense device camera (that the patient is wearing like probably similar to having a mobile these days) picks up the movement and passes it on to the software (in the device), and then the software projects information on to the pack (information that comes out as light beams) that may answer the questions on the patient's mind. These are some types of information/data that get projected on to the pack (with light beams) from the sixth sense device. This helps augment the physical world with information that is tapped from the digital media. Hand gestures read by the device, operate the device to project the desired information. This in the pharma world will obviously promote patient adherence and patient confidence in the healthcare or prescription product. Let us imagine a patient with osteoporosis gets his Rx for a calcium supplement. When the patient holds up the pack and gestures, the sixth sense gadget may project the image of an osteoporotic bone explaining that it is brittle and fractures easily. Hence, it is important to strengthen bones with calcium supplementation - this will help reduce fractures. Having read and seen the image of an osteoporotic bone and a picture of a patient with fracture, the patient will probably get more motivated to adhere to the Rx recommendations. Imagine a consumer holding a cigarette and the sixth sense device immediately projects information on to his hand that the cigarette is a harbinger of ill-health, cancer and cardiovascular disease, it is possible that the consumer may take two or three puffs and then discard the cigarette! So the sixth sense machine can herald a new era in preventive health! I got the above image from here. It is that of a baby born with a type of birth defect due to folic acid deficiency. The birth defect is called neural tube defect. Ladies planning to become pregnant and those in child-bearing years should get adequate folic acid to avoid neural tube defect (NTD) (diabetic women are more prone to delivering a baby with neural tube defect). Sixth sense tech application can help revolutionize awareness and ensure that women are sufficiently motivated to get enough of folic acid. The patient then goes towards a patient education poster (provided by a pharma marketer) on the wall, describing complications of diabetes. When the patient gestures near the poster showing a picture of a diabetic foot ulcer, the sixth sense device projects information that the leading cause of leg amputation is diabetes. Such projected titbits will obviously motivate the patient to take better measures for tight blood sugar control. This blogpost on sixth sense is a great way to start blogging in 2010! It is an exciting technology to watch out for and has potential to apply in pharmaceutical and medical field as described above. As of now, I am not aware of any work of sixth sense tech application in pharmaceuticals and healthcare or medical field. The above write-up is based on my grasp of sixth sense tech and my imagination taking over! Hope sixth sense tech makes its entry into medical and pharmaceutical field in a big way. It can be harnessed to accoutre pharma marketing efforts. Thanks for reading this blogpost, please scroll down to read all others, click on older posts, to read other posts, and please do recommend my blog to your acquaintances. THANKS, A BELATED HAPPY NEW YEAR TO YOU ALSO.